Now that I’m home from Canada, I thought I’d do a full trip recap all about our experience visiting Alberta, Canada. I have never had more requests for a trip review than this one! Also, we VLOGed this trip (video footage) so I combined it all and made it into a mini movie so you get a better idea of everything! You can watch it at the end of this post. First things first.. we flew Tulsa > Dallas > Calgary. The flight from Dallas to Calgary was 4 hours. Just a reminder that this is out of the US so you must have your passport and plan time to go through customs. I always forget about customs (aka packing a black or blue pen for filling out the form!!). Thanks to AVIS, we had a super cool SUV – the BMW X3. It was perfect for our luggage and for cruising around the mountains. Our experience with AVIS was super simple since we booked it online ahead of time. They were easy to work with & we didn’t have any issues! I think many people think of Calgary and the immediately think ‘Banff’ – which Banff is beautiful but I was REALLY glad we stayed at Lake Louise instead. We stayed at the Fairmont Chateau in Lake Louise. I think it was a little more expensive but for us it was worth it because we didn’t want to deal w/the traffic & crowds in Banff – we liked being able to walk outside right to the lake or downstairs to grab dinner or breakfast. Banff was about 40 minutes away so we only went through to get souvenirs one night – it was SOO busy there. It is more of a ‘town’ as opposed to Lake Louise is more chill and simple. Also, if the price is an issue – I will say that the canoe rides are $85 a person?!?! 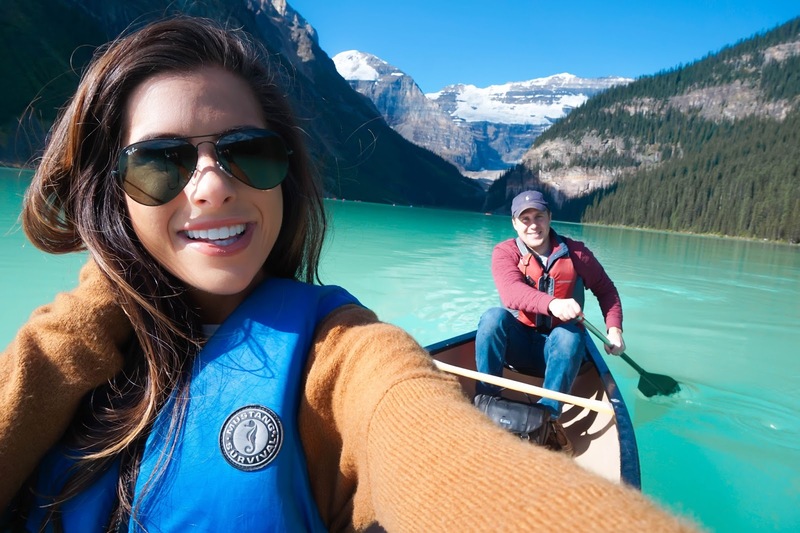 And if you stay at the Fairmont Lake Louise it is complimentary & the canoe ride is a must. ALSO, when you go to eat a meal, you don’t have to wait in line if you are staying there, you get to bypass the tourists. There are charter buses full of people coming in ALL day long so it does get a little crowded at Lake Louise. We learned that it was best to get up early to see the sun rise and beat the crowds. Its SO hard to get a photo if you get out there at 9am! As for weather – we didn’t pack warm enough clothing. The mornings and evenings were are in the 30s but during the day it was in the 60-70s – so if you are sitting in the shade its a little chilly. Definitely pack clothing that can be layered! If you have a question about where anything is from I tried to link everything and then add everything into the widget at the bottom! Visiting Moraine Lake. Its about a 10 minute drive and it is just as gorgeous! Warning: I let youtube do something to make the video ‘better’ and less shaky and it made EVERYthing wavy!! I’m so sorry! I absolutely love the way you edited the video with the record filter and text overlay! Did you use iMovie? You look PRECIOUS with a ponytail! It's so full! Love it and love all the trip info! I too am from Tulsa and headed to Calagry and Banff in 16 days! Can't wait. Thanks for the clothing tips! I'll be packing coats! Love the video and Lake Louise looks pretty amazing! Question- what do you use to edit your videos? I've used iMovie a few times but I feel like there aren't as many options with edition/text/music. The color of the lake looks beautiful! Looks like you had an amazing time! Incredible nature, I'm blown away!! Thanks for sharing your trip and experience with us! Loving the video, so cute! What did you use to film it?? OMG I NEED to go here!!! Absolutely gorgeous. I cannot believe the color blue of that water!!!!! I cannot get over how absolutely stunning the scenery is there! Your photos are amazing! Thank you so much for sharing and love the video! I LOVE your vlogs! Keep them coming! What a gorgeous and fun vacation spot 🙂 that is definitely on my bucket list! Looks so beautiful! Your pictures are stunning!! Hey Emily, loved your vlog! That lake is so beautiful! I was wondering what camera you are holding in picture 3? I am on the hunt for a new one. These pictures are gorgeous! Loving that hooded cardigan you're wearing! Isn't Lake Louise so gorgeous?! I stayed at the Chateau last year and am dying to go back. I'm from Alberta and have been their a quite a few times but I think each time I go it gets more breathtaking. Glad you had a good getaway! Visually stunning post…I can't decide what's more beautiful…the scenery, or your hair and outfits! You two are too cute! This honestly looks like the most picturesque place on earth. It looks so peaceful. I loved your vlog too! Oh wow, experiencing major jealousy! Lake Louise looks breathtaking, thanks for all the info and posting such beautiful pictures! Definitely on my bucket list! Gosh! Lake Louise is seriously one of the most beautiful places. All of these pictures are breathtaking. Loving all of the detail in this. Y'all are adorable! Glad you had such a fun trip in Canada! Absolutely gorgeous! I'm from Calgary, a city close by, and I miss it so much! Canada has the most beautiful summers, and you captured the beauty perfectly!! Loveee your travel style–so cute!! Lake Louise looks amazinggg!! Definitely on my bucket list! WHAT this looks AMAZING!! I would love to visit, the water looks so picturesque. Gorgeous location. This trip looks amazing!! I love the open front cardi — I want one in every color! What camera do you travel with? I'm looking for something small that takes great photos! Looking to travel Here and stay in this hotel! Which room did you choose? Was it a suite with balcony?